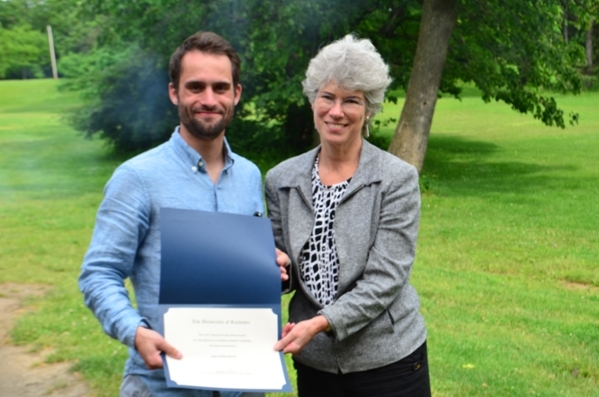 Congratulations to PhD candidate Jacob Kallenbach who was awarded the prestigious Edward Peck Curtis Award for Excellence in Teaching by a Graduate Student. Jacob was nominated by Professor Ian Dickerson for his service as a Teaching Assistant for his course, BME411, Cell and Molecular Biology, in the Fall of 2016. Established to encourage excellence in the work of graduate students who assist undergraduate instruction, the Edward Peck Curtis Award for Graduate Students is awarded to a small number of full-time graduate students with a role in undergraduate education. Nominees are expected to have had significant face-to-face interaction with undergraduate students in the classroom or laboratory. Awards are determined by the Vice Provost & University Dean of Graduate Studies, based on nominations from individual departments or undergraduate student groups.